I was fortunate enough to have attended the 15th Anniversary celebration (and first annual) Good Things Event in New York City on September 30th. 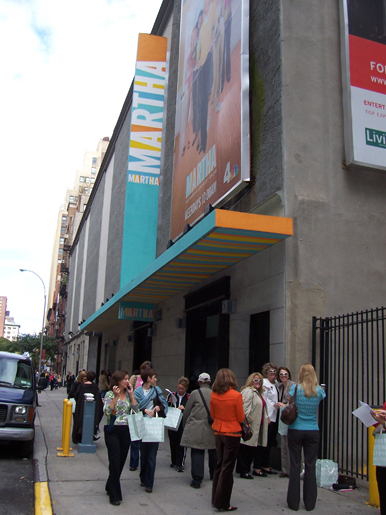 The day before I attended a taping of The Martha Stewart Show - part of a lucky audience who were all there to attend the event the next day. Below is a full account of the seminars that took place, beginning with my experience at the show. It was truly an amazing experience! Hope to be there again next year! Joey Kola: imagine a round man with a beard and glasses and a high-pitched voice affected by a delicious New York accent. Imagine him waving his arms around frantically and rubbing his tummy on cue, urging us to mimic him.This is the man who is responsible for warming up Martha’s audience every morning. Like a lightning bolt, he arrives and starts shouting joyfully at us as we sit in our seats, nearly making us drop the muffins that are provided for us on a big table in the waiting room. He gives an old man in the front row a dollar bill because he knows he’s been dragged there by his Martha-loving wife. He attempts to give me one too, but I tell him that I actually want to be there and he promptly snatches it back from me, causing everyone to laugh. Laughter is his business. He’s a stand-up comic on his days off and he had us giggling incessantly. The room in which we wait is all white with simple wooden chairs. The walls are decorated with framed photos of Martha’s dogs. We are instructed to tell our Martha stories on a portion of a white piece of paper, or to ask her a question. The producer collects them all and sifts through them.By this time I’ve already met several fabulous ladies: Eve from New Jersey whose husband is from Montreal and Christine and Joyce from Nebraska who are friends but are also bound by a boss/employee relationship. They immediately embrace me: one of the few men to have arrived here of his own free will! We gush with Martha enthusiasm and share our personal stories like cowboys around a campfire…except we dish about homemade pies and ribbons instead of ox meat and lassoes. It was all so charming.We are led into the studio by the audience coordinators in sections. There are others here from Canada, too: some from Toronto, some from Calgary, and me, from Ottawa. Others have traveled from California and Florida. All of us here today are going to the “Good Things Event” the following day and we were invited to attend the taping since we were the first 170 people to purchase tickets to the event. The set is breathtaking. There is no other word to describe it. It literally takes your breath away when you see it. It is vast and sprawling and gleaming. And it is alive with busy stylists and cleaners, fussing about as we take our seats. The energy is palpable.We are introduced to the director and the producers and last-minute preparations are made with people running in and out of doorways. Joey keeps us all up with his contagious excitement. Exuberant music plays over the speakers. 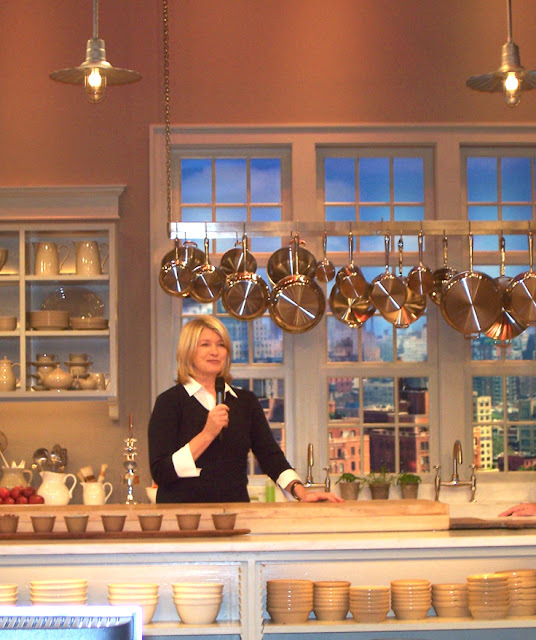 There is a hush as Martha enters the prep kitchen with Donny Osmond to do the teaser for the show. In moments she will come out and we are all anxious! The countdown begins and the theme music comes up. We are instructed to cheer but there is no need to, we do it anyway!The doors open and there she is, all aglow and smiling! We give her a standing ovation and cheer so loudly it is deafening! Martha is wearing dark Ralph Lauren jeans with a big brown pony logo on the back pocket, dark brown heels and a black sweater over a crisp white blouse. She is strikingly tall and thin with her thick thatch of highlighted hair neatly styled. Throughout the show Martha thanks her stylist, Eva Scrivo, for making her look so glamorous. Eva is in the audience and smiles graciously. Before it all begins Martha takes us through some of her favourite Good Things, including using a candle to reduce tears while chopping onions and using the end of a potato to remove a broken light bulb from its socket. The other good thing is a small blue box tied with ribbon containing a new mp3 player, which everyone in the audience receives, much to our delight! The first guests are Donny Osmond and a rack of pork loin. We are instructed by Joey to go “mmmmm” whenever Martha does something sensually delicious to the slab of meat on the counter. Donny talks about his starring stint on Broadway as the villain in “Beauty and the Beast.” After his segment we are given onion goggles and a free DVD with the best of Donny and Marie Osmond’s former television program. Next is Norah Ephron who talks about her new book, “I Feel Bad About my Neck” – a wry tribute to the process of age. We all receive her book, of course! They make key lime pie and laugh about the horrors of aging, dating and ex-husbands.I noticed that the producers are listening to the fans who have complained about not a lot of content when they air a pre-taped segment about an organic farm. Martha speaks to the manager of the farm by phone from the greenhouse section of the set. The show closes with Martha showing us her favourite good thing: the glass bottle of dishwashing liquid.Throughout the program Martha is jovial and bright. At one point she is so taken by her topic that the stage director goes into a frenzy trying to get her to wrap up the segment, waving his hands around frantically trying to tell her to close the segment before they go to commercial. People are running around silently with cue cards and secret hand signals are being given left and right. Martha is mostly oblivious. During the commercial breaks she seems tense. Her jaw clenches a bit as make-up artists and stylists flock around her and poke and prod. She is led across the set by a few women who are all talking at once and Martha nods accordingly but is clearly not listening to them. As she waits to come back on air she seems occasionally bored. I can imagine it must be quite a grind to do this every morning, although she clearly enjoys the process once the cameras are on again.After the show closes, there is an off-camera Q&A with audience members. Martha asks us if we have gone out to any shows or restaurants. One woman from Florida tells her tale. I raise my hand and she spots me. “We have a question. Yes, sir,” she says to me. I ask her what her favourite Manhattan restaurant is and what she recommends. She goes on at length about all her favourite Manhattan restaurants and says that she is really into Japanese food, and has been for the last few years. She says she loves having poached fish and says that more people should eat fish off the bone. She says people are not sophisticated in their knowledge of fish and that she really feels the need to re-educate them. Martha loves the whole fish – head, fins and all – and likes to eat it from the bone. She tells me to go out and have fun that night before the Good Things Event the next day. Another group of girls in the audience stands up and asks a question about keeping marble counters clean. They are all wearing vintage aprons and Martha loves them! She does, however, tell the girls to loosen up about their stain fixation: “Loosen up, girl! I like the look of aged counters! Use them! Love them!”Another woman gives her a photo of her graduation with the words “It’s a Good Thing” written on a banner over the stage. Martha loves the photo. Martha says that Alexis has gone too far in her pursuit of purity and shared a story about Alexis not allowing Martha to have a key to her apartment. Martha is paranoid she may die there alone and wants a key just in case of emergency. Alexis refuses. She says Alexis has everything locked away in cabinets and safes and filed onto discs that are protected by passwords and safety codes. She rolls her eyes. As the Q&A winds down, Susan Lyne and Charles Koppleman arrive with a few other executives. Martha says she has meetings and thanks us all for coming, saying she will see us again tomorrow. We all applaud as she leaves and are then instructed to leave by section.Waiting by the entrance are our “Martha Stewart Living Omnimedia” bags filled with our give-away prizes, all neatly stacked in a row. We depart and I say my goodbyes to Eve and the couple from Toronto and meet a new friend, Douglas, who is going to wait to catch a glimpse of Martha leaving the studio. These lovely ladies showed up wearing beautiful vintage aprons for the show. I catch a cab and continue on to the hotel where I have a brief nap before going out to explore the town. And what a town it is! I am in awe of the entire experience I just had and even more excited about tomorrow’s big event! The line spanned almost the entire width of the warehouse, writhing with neatly dressed women (and a few men) who were all eager to get through the front doors. 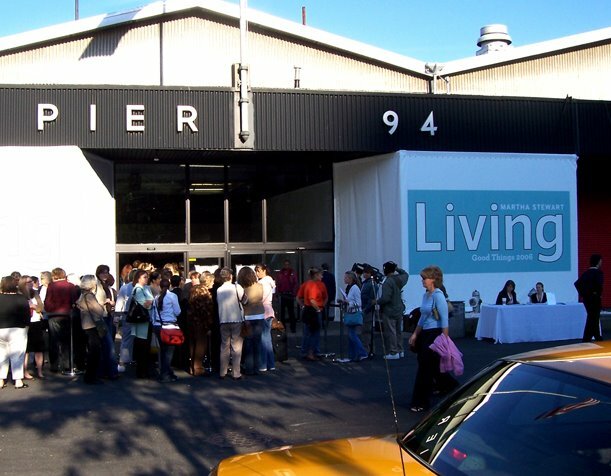 At the entrance were big banners that said “Martha Stewart Living Good Things 2006” and tables set up for people who wanted to buy tickets. It was a beautiful, sunny morning, though cool, and everyone was energized. Christine and Joyce adopted me and kept me company the whole time. They were the sweetest women! We waited and waited for the shuttle bus as a construction worker jack-hammered his way through the cement in front of us, and through our ear drums. The wind picked up and got extremely chilly so we decided to forego the shuttle and hop into a cab. We were there in less than 10 minutes and got in line. As we filtered through the doors, we were given wrist bands, with the aforementioned event name written on them, and pamphlets about the event, which had the seminar schedules and the locations of events, galleries and workshops.The palette of the entire warehouse was slate grey: grey carpeting, light grey walls and a ceiling of open duct work with small warehouse windows letting in filtered light above hanging fluorescents. It looked industrial but warm. All around us were images from the magazine: hanging from banners from the ceiling, erected on easels, mounted in frames on the walls. There was a seating area of white leather furniture near the entrance and staff members running around in brown shirts and name tags. The booths in the first section were devoted to Martha Stewart Signature furniture, which had a bedroom scene all set up (I love that nickel-plated bed frame!) the Everyday Food section, which had ongoing demonstrations, a section where one could make personalized journals (the line for this was enormous!) the Sirius booth, the Epson booth and one of the classrooms where flower arranging would take place. The Weddings booth was quite extravagant with professional dancers waltzing about, glorious wedding cakes, models showcasing wedding gowns and a long table where Weddings editor Darcy Miller was making favors. The Body + Soul booth was alive with massage tables with women sprawled out being rubbed up and down and a tables set up with pamphlets and information on healthy living. (I’ve never been a big fan of Body + Soul magazine and its commercial insistence on spirituality so I only just glanced at this section from afar. 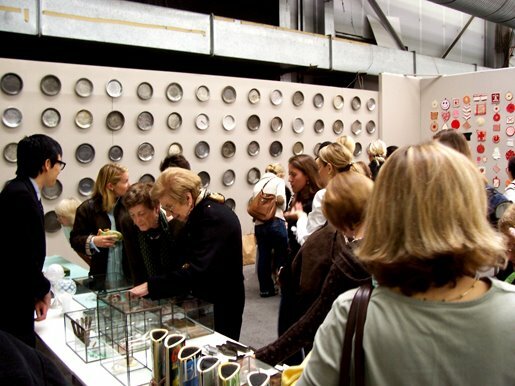 Quy Nguyen speaks to some curious collectors in the collecting booth at the event, which was festooned with vintage pie plates and crocheted pot holders. Down another corridor were the rest of the five classrooms where classes on pumpkin carving, cooking, decorating cakes and cookies and setting the holiday table would be taking place. The classrooms were closed off from the rest of the corridor but had open ceilings. There was also a Best Buy section, with a full kitchen set up and a garden section with a makeshift patio.My two favourite sections were the collecting section and the Good Things gallery. Collecting with Fritz was beautifully set up with a wall of antique pie plates and vintage knitted pot holders. There were glass tables filled with glass and silver items, a little section containing old publications and two tables where guests could have their own items evaluated by Fritz and his editors. It was a striking space. 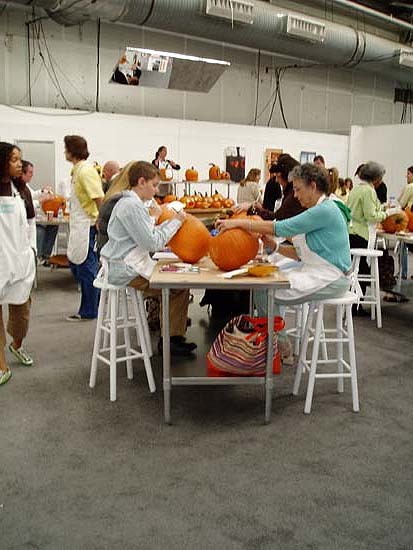 The Good Things gallery, too, was a lovely reflection of the crafts that have graced the covers of the magazines through the years, particularly the blown eggs in all their forms: Halloween pysanky and marbleized and dyed for Easter. 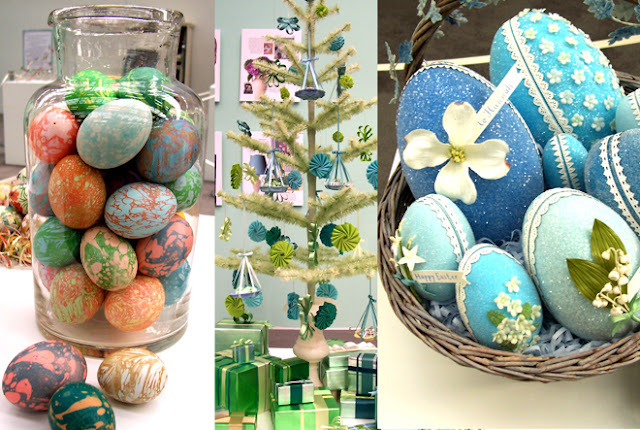 There were fabricated Fabergé eggs, too, and a turkey feather Christmas tree from Germany decorated with holiday crafts from the magazine with neatly wrapped boxes under its branches. Along one of the walls were plaques containing some of the best Good Things. 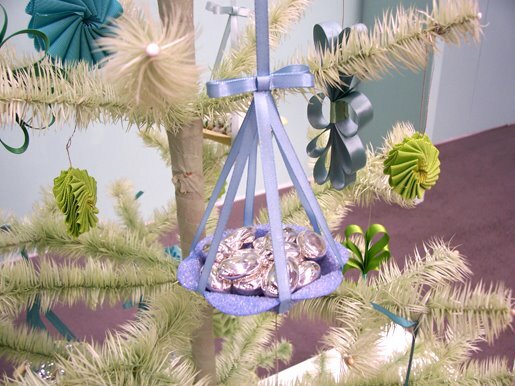 Beautiful details in the Good Things gallery; hand-dyed and handmade easter eggs and a vintage feather Christmas tree with handmade ornaments were among the beautiful, artistic crafts on display here. There was a small ‘store’ where people could purchase any number of Martha’s books, DVDs and T-shirts. This seemed a tad disorganized and a tad small. There was only a small table and two huge lines: one for picking up the merchandise and the other for paying.At the end of the corridor was the café with small café tables covered in linen table cloths. There was free coffee, tea and muffins in the morning and an afternoon cookie and coffee break in the afternoon. All around the centre were tables laden with fresh fruit, which we could help ourselves to: a variety of pears and apples. We could fill entire bags full, if we wanted to. Likewise, there were large bins of bottled water all around the centre, which we could help ourselves to. There were three choices for lunch, all of which were sandwiches. They came in cardboard lunchboxes and I chose the smoked turkey with brie and pomegranate. The sandwiches were in two small brioche buns and there was a pasta salad dish, an apple, a brownie and some bottled water.While it tasted fine, there was something a bit too casual and sloppy about it for a Martha Stewart event: a cardboard lunchbox with sandwiches and plastic forks. It was fine for a picnic, but not really fine for an event that cost $170 to attend. We were instructed to eat it ‘anywhere we wanted to’ and it looked peculiar to see nicely dressed women with cardboard boxes in their laps munching on a brownie. The other issue is that garbage piled up, cardboard and plastic dumped into large plastic garbage bins. There didn’t seem to be a recycling option, either. It would have been better to have a sit down meal. If staff was an issue, a simple buffet table with a mix of hot and cold food selections would have sufficed. Sturdy plastic plates would have been fine if breakage was a concern (there are some very nice plastic plates out there!) and stainless steel cutlery would have been a nice touch.There was a photo gallery and silent auction leading into the general session room, where the seminars would take place. The gallery had approximately 45 photographs (I didn’t count) from the magazine – actual prints by the photographers, including two photographs by Martha Stewart of her Bedford farm. The ones that seemed to attract the highest bids were Martha’s and the images that had graced some of the covers, especially the floral arrangements. They were all framed and matted and were wonderful to look at.In the gallery space was a cocktail lounge where wine and alcoholic beverages were being served. All around me were women, women and more women! I really was a minority here. I did notice several men, of course, but we were clearly outnumbered. It was wonderful to see the excitement on their faces and the truly genuine interest we all had in these events and subjects. 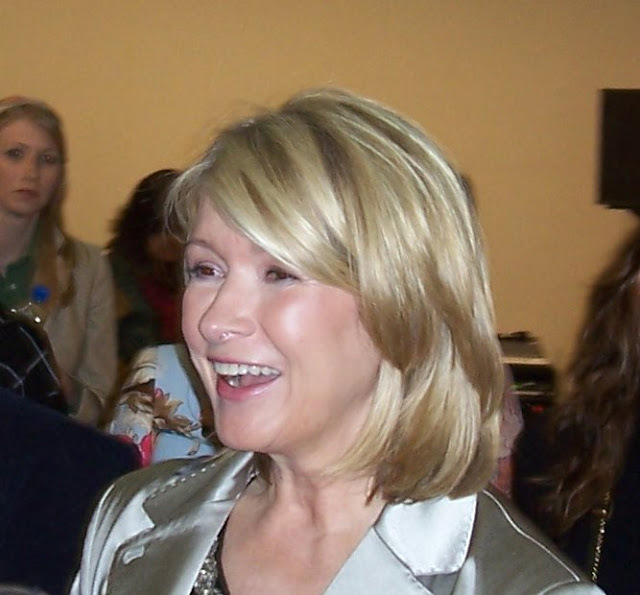 It felt like a reunion, of sorts, and it was so easy to go up to a stranger and begin a conversation since we were there for the same reason: Martha Stewart.I did privately marvel at the fact that all of this fracas and hullabaloo was simply because of one woman from a working class town in New Jersey and her dreams of good living. It truly is remarkable, I think to myself as I wander into the seminar room where people are already taking their seats to hear Martha speak. 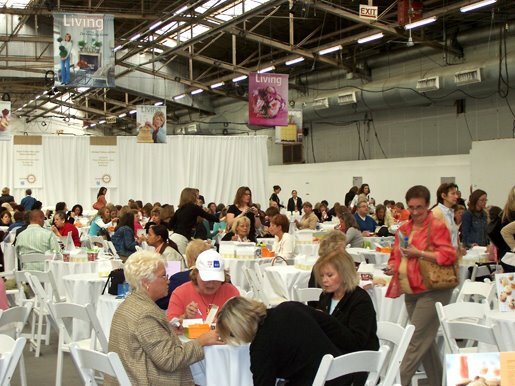 The room where the seminars took place was cavernous and filled with rows of fold-up white chairs. To the sides were the technical booths and there were two giant screens flanking a large stage designed to look like the entrance to one of Martha’s KB Homes. There were LCD television screens hanging from the ceilings and large speakers placed around the room. The screens all displayed a new logo: a circular “Martha Stewart” emblem that shone in light blue. To warm us all up, Joey Kola came out like a dart and got the crowd moving, going through the audience and asking where people were from: Florida, Maine, Nevada, Canada, Germany, Switzerland, England…As he asked us if we were ready to see Martha, the curtain in the window of the set behind him was pulled back: Martha poked her head around the curtain and gave a coy little wave. Seconds later, she strode out with a big grin and everyone rose to their feet in applause. She looked beautiful in dark jeans with heels, a silk jacket and a black camisole with elaborate beading around the collar. She was bashful and told everyone to sit down, but was clearly excited to be there. Martha began by thanking us all for coming and said how wonderful it was to be able to host an event like this in celebration of 15 years of the magazine’s publication.She began a slideshow that encompassed numerous images from her homes in Connecticut (Turkey Hill) and Long Island (Lily Pond) and Maine (Skylands.) Many of the photos were from her Entertaining and Christmas books with additional photos from her recent birthday party in Maine, where they dined outdoors in the woods near the waterfront. She alluded to a future story in the magazine that would contain more photos from this celebration. Martha was full of news for us. She talked about the new circular logo I mentioned above and said that it was going to be used on all of their merchandise and publications from now on. (You can even catch a glimpse of it in the October issue of Martha Stewart Living at the bottom of the credits pages near the front.) The logo was designed by Steven Doyle, who is the husband of Chief Creative Director, Gael Towey, and was carved by hand out of a plaster disc, then made into a mold. Both Gael and Steven were in the audience, along with many other Omnimedia staffers. 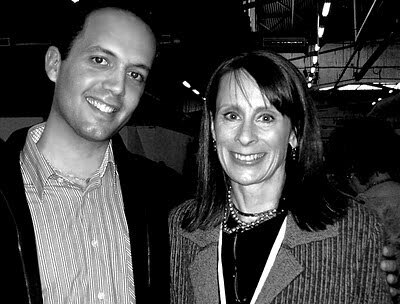 Margaret Roach, chief editorial director, was sitting not too far from me, and I had the good fortune of speaking with her later that day. Martha also gave us a preview of the November issue of the magazine and showed us the cover: a lovely Thanksgiving scene photographed in her stables with the stable doors opening out onto a snowy field beyond. It was breathtaking. Other photos from the spread show her horses peeking out from their stalls and beautiful close-ups of the delicious food that was served. All is not as it appears, though, as Martha soon warned us. On the day of that shoot, the weather was so cold that everyone was extremely miserable and impatient. To add injury to insult, Martha chopped her finger with a carving knife that day and had to be rushed to Mt. Kisco hospital for stitches. Not even her dogs were spared: her little dog Francesca was kicked in the face by one of her horses and moaned the entire day! She alluded to other magazine horror stories, like the Fourth of July story in last July’s issue when temperatures hit 110 degrees and everyone was drenched in sweat, and how during one of her former catering jobs she hadn’t taken lighting into consideration, so the guests were stumbling around in the dark, tripping over the buffet tables and spilling their drinks everywhere.Martha also mentioned that they were working on a special ‘pink’ issue (but wouldn’t say when it was coming out) and that the new website will launch in early 2007 to be more streamlined, easier to access all the great content and will also have a new section devoted entirely to all the great sources around the country that the staff at the magazine frequently use. The slides were more nostalgic than educational but she did pluck some keen entertaining lessons from them: Always take responsibility for every aspect of a party you are serving; Use your imagination; Look for seasonal clues to determine your decorating colour choices for a party and when selecting menus. Martha shared one of her own moments of inspirations when she talked about noticing a mound of snow on one of her garden chairs and she employed its pretty pattern to the icing on a holiday cake one year. It’s all in the details! Martha then turned our attention to the large table before her, which she was going to set for us. The table was a holiday table and the colour scheme was truly striking. The table was black and the wooden chairs were painted a bright turquoise. On the table were gorgeous sets of china done in teals and blues offset by a plethora of sparkling silver accents. The theme was Noah’s ark, and she had crafted a large ark out of cardboard scraps and then painted it silver. She applied glue to plastic animals and then doused them in crushed glass glitter, placing them down the blue table runner at random to create a scene. The blue, she said, evoked the coolness of winter and the aquatic motif of the Noah fable. I wouldn’t be surprised if a table similar to this one appears in the December issue of the magazine. 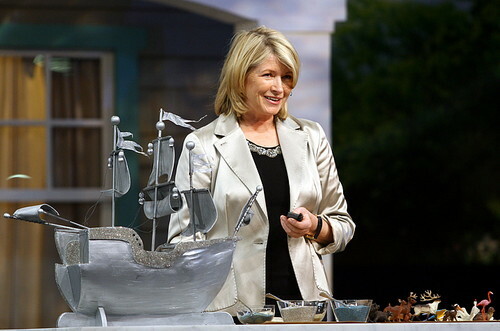 (All the furniture used in the demonstration was by Martha Stewart Signature, by the way.) During Martha’s speech, we were instructed not to take photographs since it was being filmed. In fact, the entire event was filmed from the time the doors opened to the time they closed: all of the seminars, all of the classes, the silent auction, the lunch; it was all filmed.My feeling is that there may be a DVD of the event, or perhaps a television special.Martha’s seminar was an hour and a half and she closed with an audience Q&A. Martha’s assistant brought out Martha’s dogs: Paw-Paw, Francesca and Sharkey. She said that they would all be strolling around the event throughout the day and that she wanted to meet as many of us as she could in that time.It was thrilling! The former editor-in-chief of Martha Stewart Living magazine, Stephen Drucker, once called Margaret Roach a hummingbird. Seeing her petite frame alight with energy against the backdrop of an overwhelming stage, you understand why. 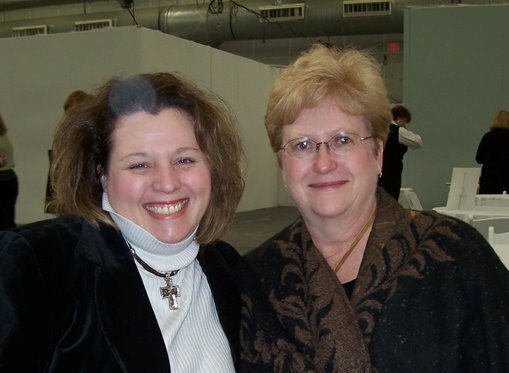 Margaret was charming and affable - a truly sweet lady. She spoke beautifully about her garden and some of its amazing features. It was nice to finally meet her and speak with her, face to face. Margaret took the stage not long after Martha and spoke about the ‘four seasons garden’ – the process of growing and enjoying a garden all year round. She urged us to enjoy the many stages of a garden’s lifecycle, from the peculiar forms of buds emerging from the soil straight through to the dried-up old skeletal leaves that fall from the branches in November. Plant as many foliage plants as floral plants and look for plants that have unusual leaves, she pleads. Don’t overlook the beauty of seemingly ordinary things like grasses and non-flowering shrubs. Observe the 'little miracles' of growth and don’t be scared to transform a daunting space into the most strikingly beautiful garden you could possibly imagine. Persist and ye shall overcome. Margaret took us through slides of her upstate garden in Copake Falls, New York. (To see my own photos of this garden, please click on the “Margaret Roach” link to the right.) She showed us plenty of before and after photographs that really did bring to light the work and vision involved in creating such a spectacular space on such an old and hilly lot, one that had only a rhododendron and an 100-year-old lilac bush on it when she first bought it.She spoke beautifully about nursing her mother through the ravages of Alzheimer’s disease and how she desperately needed a distraction. The distraction, as it turned out, happened to be her mother’s garden, which she renewed with the spirit she says she found inside herself during those lost years of grief and sadness. Prior to that, she had not much interest in gardening, which I found quite touching: the idea that an entirely new and thrilling dynamic to a person's life and personality could emerge from a difficult time.Margaret joined the magazine in 1993 as the gardening editor, after having a garden column in the New York Times for several years, and today she is the chief editorial director of the entire company, overseeing the streamlining and editing of all of the written content that the company produces in all of its publications, ads and on the web. Margaret’s belief is in a natural garden, which speaks to her earthy nature. She spoke during her seminar about being the ‘odd duck’ at Martha Stewart Living since she is really just a wannabe farmer working on the 25th floor of a stark office tower.She called herself an ‘old hippie’ and said her gardening philosophy differs greatly from Martha’s. “Martha likes flowering plants and I like foliage plants,” she says proudly. “But we’ve both learned so much from each other.” She called Martha her greatest teacher and reminded us, again, to love nature, not to fight it, when planning our own gardens. Kevin Sharkey, Eric Pike and Gael Towey take the stage after Margaret, sitting on stools like a panel of judges at a table. Eric seems nervous and annoyed by the shocking loudness created by the sounds the headset microphones make every time one of them says a word beginning with a P or a hard F. His grin looks teeth-clenching but his nervousness endears him to me. Kevin is more strident and perches on his stool with a haughty look, but he is warm when he speaks. Gael seems open and lovely and radiates a calm confidence; her family was sitting in the audience, just a few seats from me. Gael is the company’s chief creative officer, responsible for overseeing the company’s overall aesthetics and creative mandates. Eric is the company’s creative director and “Father Christmas,” responsible for the holiday division at the magazine, the look of the magazine and the production of many of the stories. Kevin is the editorial director of the decorating section of the magazine and he styles and plans nearly all of the stories on decorating.Together they take the audience through their favourite stories over the years, from the use of bold colour in rooms to some simple decorating solutions that can really transform a room, like painting a lampshade or displaying your favourite collections in ways that are attractive and appealing. The seminar gets extremely emotional at one point when Gael describes traveling with Martha over the years and what a tremendous opportunity it is to experience life at her side. She mentions a trip they took to Japan in September of 2001 and recalls with sadness the day of the 11th when the Twin Towers were destroyed by terrorists. She described going to a Zen garden with Martha and Kevin to meet with some Japanese business men regarding the launch of the Japanese version of the magazine. Before they began their meeting the bells in the garden chimed America The Beautiful. Recalling this moment reduced Gael to tears and there was a beautiful moment of silence as we reflected on that day. People in the audience (many of them native New Yorkers) were crying also. 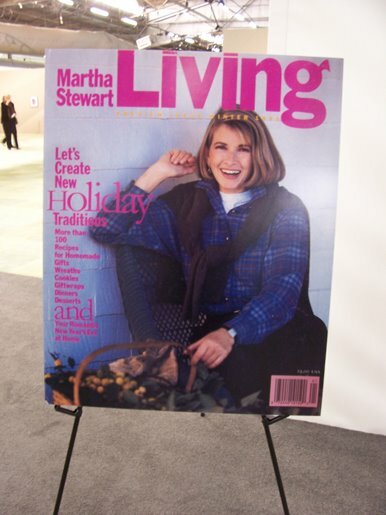 The people who work at Martha Stewart Living seem deeply sensitive to me. Even Eric Pike, who talked about his cool, gray apartment, which he admits can come off rather cold to people who don’t know him, defended his decision to paint everything gray by saying that he needs the restive break from all the colour he works with every day when he returns home from work. He finds it warm and blissful to be surrounded by the decorating manifestation of a cozy, cloudy day. At that moment, I understood his apartment, which I admit had always seemed callous in any of the photographs I had seen of it. But I understood his philosophy (and Eric, by extension) after that description. Kevin, who is a close personal friend of both Martha and her daughter, Alexis, clearly loves his subject and knows it well. With a degree in architecture and an inherent talent in design, he has brought so many small but wonderful touches to the magazine's decorating features. He says that anywhere we see a café curtain in the magazine, we can rest assured that he had something to do with it, since he is obsessed with café curtains. Eric, by contrast, loathes them and says that Kevin usually has to do a lot pleading before Eric allows a café curtain into a story.The trio also talked about the next line of Signature furniture based on Martha’s Bedford furniture, which is due out next year. They showed an example of a bureau done in a Chinoiserie style, painted a dark red with delicate gold trimmings. It was exquisite! This seminar was the most demonstrative and got the most reaction from the audience as a result. Melañio is extremely funny and warm with a bright personality that doesn’t efface his devotion to duty. He injected his seminar with lots of humourous anecdotes, including being mistaken as Martha’s son during a location shoot in California. To make his point about the absurdity of that assumption, he put up a photo of himself next to one of Martha: dark, Filipino Melañio next to blond, Polish Martha.“As you can see, the resemblance is striking,” he says.He spoke, too, about going up to Martha’s home in Maine, Skylands, to produce a story on storing vintage linens. He said it was the simplest story he has ever had to produce and said that everything we read about Martha’s understanding of the smooth-running home is true. Everything was in its place and labeled, he said, and he merely had to add a few creative touches to the photo shoot in order to get the final product. Martha’s efficiency made it simple.He then gushed about the pantry at Skylands and showed photos from a previous issue of all the wonderful organizational features the pantry contains, from compartments in drawers for doilies to large rollers where her silk table cloths are stored so they don’t get wrinkled.With two of his assistant editors, Melañio then demonstrated how to dress up a bulletin board and showed us how to organize a closet using simple tools and supplies form the hardware store.The audience was very responsive to Melañio and he was surely the favourite of the day, from what I heard in the crowd. He kept everyone alert by demonstrating instead of simply speaking. And his personality is totally engaging. The final seminar of the day was another hands-on demonstration about fast entertaining. Lucinda Scala Quinn and her assistant, editor Jennifer Aaronson, created a fuss-free cocktail party from scratch and made three different kinds of cheese balls, blood orange punch and lemon-parsley gougères (little puff pastries.) After the seminar large recipe cards for these delicious treats were handed out.Lucinda and Jennifer worked well together and before beginning the demonstration took us through some of their favourite stories to work on, including an easy rib dinner with my favourite cornbread recipe of all time!I have always loved Lucinda’s column in the magazine, which now appears bimonthly, and we can get more of Lucinda when the Everyday Food DVD comes out soon.The audience, again, was very engaged with the cooking demonstration, which went smoothly. It seems that these more hands-on type of activities and seminars are what people were really looking forward to. More classrooms with more activities would have been nice, I heard some people say. More advice and demonstration in the gardening and decorating seminars would have been more inspiring, others mentioned to me, a better lunch that produced less waste and a larger store with more than one cash register. Still, it was a fantastic event and very well planned. The gallery was especially nice and the real beauty of it was feeling like part of a larger family of readers and editors, all of whom came together for one short day to interact and share with each other. Martha did a book signing, also (although the line was immense) and told some interesting tales about the photographs in the silent auction, which was co-hosted by Gael Towey and Eric Pike. 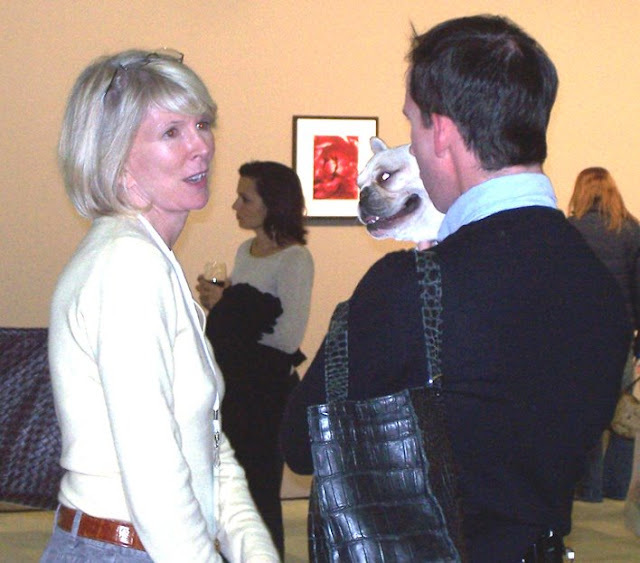 Susan Lyne and Kevin Sharkey chat in the gallery. Kevin is holding Martha's handbag and her French Bulldog, Kevin's namesake, Sharkey. Martha is much warmer and more receptive than I had imagined she would be (not to mention taller and more beautiful than she appears on TV!) and she was always gracious in her interactions with people, including with me, when I was able to tell her how wonderful it was to be there. She thanked me for coming, surrounded by her body guards and assistants, and went on to others in the crowds gathering around her to hear their thanks for the love of living she brought to them through the pages of her magazine. We all received a canvas bag filled with each issue of the Martha Stewart Living publications S(Martha Stewart Living, Everyday Food, Body + Soul, Blueprint and Weddings) a can of Pam cooking spray, a UPS measuring tape, Best Buy gift certificates and some Martha Stewart product adverts. I would go again next year and definitely plan to if it’s on again! 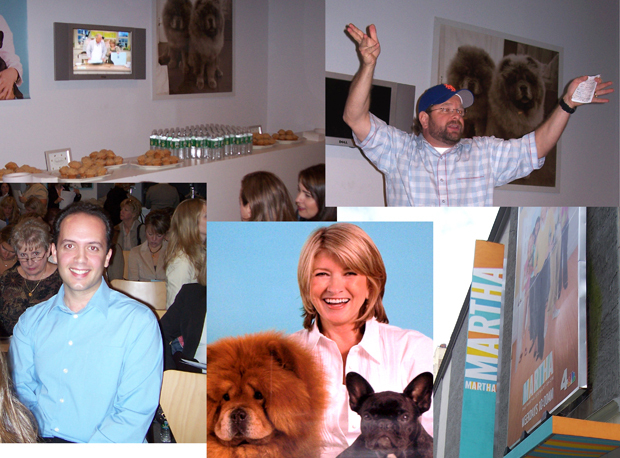 Oh, and it was so cute to see Martha’s dogs Paw-Paw, Sharkey and Francesca around the event! 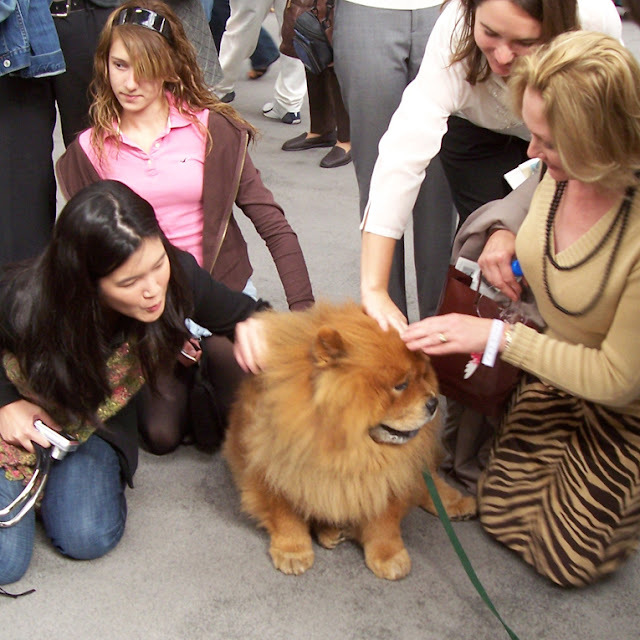 They were fawned over, petted relentlessly and cooed over endlessly! You did meet her! This is an amazing post. I will have to come back and finish it. It is my dream to go to her show one day. I have taped and watch every one of her shows. I was on a Viewer Mail segment too. The one where she gave a tour of back stage. That was me on the phone live with her. I live in Calgary so it's wonderful to find another Canadian Martha fan!